Former stand-up comic and unlikely pastor Nadia Bolz-Weber weaves personal narrative, hilarious rants and powerful spiritual insight as she relates her unusual journey of faith. 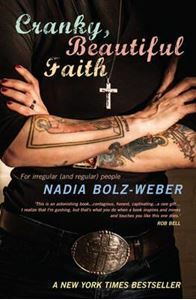 Former stand-up comic and unlikely pastor Nadia Bolz-Weber weaves personal narrative, hilarious rants and powerful spiritual insight as she relates her unusual journey of faith, offering a fresh and uncompromising look at the transformative power of grace. As one of today's most provocative Christian leaders, she blends sardonic irreverence and brilliant theology to offer a new portrait of faith - one that is edgy, outrageous and, above all, real. Smart-mouthed and heavily tattooed, Nadia Bolz-Weber didn't consider herself 'religious leader material' and didn't expect to find her vocation leading a funeral in a smoky, downtown comedy club. But surrounded by recovering alcoholics, depressives, and comedians, she realized these were her people and maybe she was meant to be their pastor. This compassionate book portrays both church and seekers as deeply flawed yet deeply faithful. be refusing to allow past violations to determine our present and future choices, cycles of violence can be broken. Each choice aimed at stepping out of the cycle, whether successful or not, is a peace act. Swarthmore Lecture 2015. To say 'yes' to peace we must say a final 'no' to war and join together, heart and soul, in the task of creating peace by peaceful means, speaking with one authentic and passionate voice.